Subash Ghisingh's Man Friday, Mani Gurung, who had stayed with the ex-DGHC head when most GNLF leaders had snapped all contacts with him, today joined the Gorkha Janmukti Morcha. 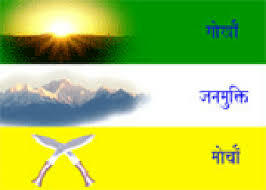 Mani said Mann Ghisingh, the president of the GNLF, didn't understand "the A, B, Cs of politics". Subash Ghisingh's Man Friday, Mani Gurung, who had stayed with the ex-DGHC head when most GNLF leaders had snapped all contacts with him, today joined the Gorkha Janmukti Morcha.